I’ll group these three together, because they all speak to different facets of a problem facing professional hockey: namely, that it’s steeped in a culture that belittles injuries, enables painkiller use, and neglects the mental well-being of its athletes. All three athletes profiled are casualties of the sport, in a way: Tootoo struggled with alcohol and dealt with racism, Fleury turned to drugs after being abused by a minor hockey coach, and Boogaard developed a painkiller addiction. Tootoo and Fleury were able to recover. Boogaard paid the toll with his life. Often, we see athletes through a very narrow prism: either as avatars of our own sports fantasies, superhumans immune to injury and criticism, or spoiled millionaires playing a child’s game. These books serve an important purpose by humanizing them. On April 12, 1980, Terry Fox began his Marathon of Hope in St. John’s, Newfoundland by dipping his prosthetic leg into the Atlantic Ocean. He was just a few months shy of his 22nd birthday — younger than I am today — and battling osteosarcoma. He would go on to run over 5,300 kilometres, completing nearly a marathon a day for 143 days. 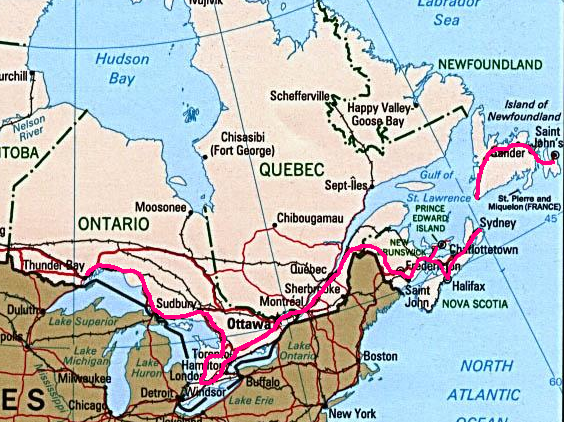 Terry Fox’s path across Canada. From Wikipedia. What compels a person to run across the second-largest country in the world? It’s a near-unfathomable task, a story of audacious hope and perseverance that has inspired me for years — both in my songwriting and in my approach to life. Visiting the place where his journey began 35 years ago was a special moment. On my way to the airport, I got to talking to my shuttle driver. It turns out, he worked in Manhattan for years and would have been at his office in the World Trade Centre on September 11th, 2001, had he not decided to sleep in an extra 15 minutes that day. As the chaos was unfolding on that day 14 years ago, Canada launched Operation Yellow Ribbon. According to Nav Canada, 68 diverted planes landed in Newfoundland on September 11th, and another seven landed in Labrador — more than any other province in the country. Gander International Airport alone received 38 flights — more than any other airport in Canada except for Halifax. Newfoundland’s communities came together to welcome the stranded passengers, and it became one of the bright spots of humanity to emerge from 9/11. 1. The Narrows in St. John’s. This was the view from our rental house on Battery Row. It’s the perfect encapsulation of what I’d imagined of Newfoundland before going: small, coloured houses, spread out along the shore. Out of sight to the left is Signal Hill and Cabot Tower. The mural is what caught my eye. Upon doing some further digging, it seems to have originated in 2006, and it turns out the mural has changed over the years. Another note: it’s pronounced ‘Pooch’ Cove. Good old Newfoundland. It’s rare to get a shot of coloured houses without a bunch of cars blocking the view. Gower Street is probably the most notable place for coloured houses in St. John’s — and deservedly so — but this one actually came on a side street. Shane O’Dea, an expert on architectural heritage and historic preservation, said the idea of fancy window and door trim, and brightly-painted houses was born in 1977. In fact, the idea can be traced to one man, David Webber, the foundation’s executive director. 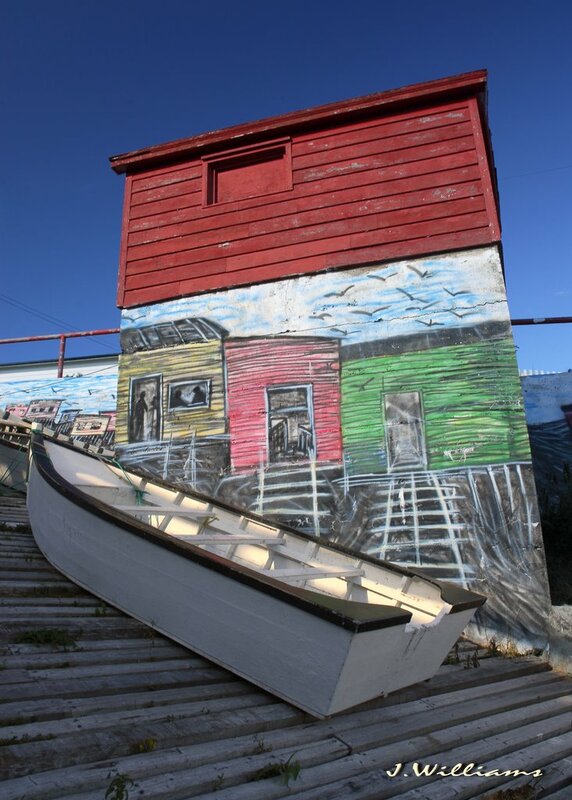 In that year, the foundation took on a demonstration project by painting a sample block in bright colours, from Willicott’s Lane to Victoria Street, on both sides of the street. The sample block was an immediate hit, and spread like a cold into the surrounding neighbourhoods. People began renovating their homes, adding fancy trim and switching to the bright colours, until the entire downtown was decked out in its best and brightest. Meanwhile, heritage conservation bylaws preserved the majority of older houses, to the point that St. John’s now has a heritage district that sprawls across the entire downtown, and is the envy of cities across North America.